AAGP | Join AAGP | Meetings | Dig Pics | Business Digs | Prospecting Lessons | Purchase GOLD | Equipment For Sale | Events Calendar | FREE GOLD! 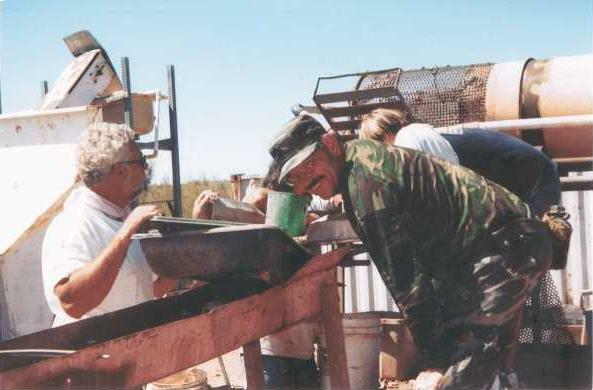 The Arizona Gold Mining Adventure has been a long kept secret known only to a very few people who truly enjoy GOLD prospecting and mining. It's been a hit with all including celebrities who demand their privacy while enjoying the Old West. When the word started getting out and others expressed a desire to participate we've decided to open up the adventures for others to enjoy as well. 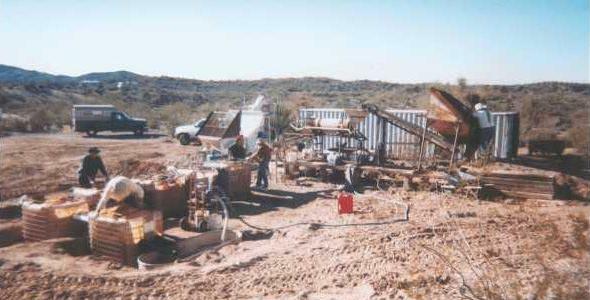 Arizona Gold Mining Adventures are held at the Paydirt Mining Company commercial placer GOLD mining operation located in the San Domingo Placers area near Wickenburg and Morristown Arizona. Your Arizona Gold Mining Adventure will consist of a total of five great fun-filled GOLDen days beginning on a Monday and ending on a Friday. On your first day you will get your accommodations situated and you will participate in group professional GOLD prospecting lessons with emphasis on Dry Washing for GOLD in the desert. The next 4 days you will help set up and run a real commercial placer GOLD mining operation. On the fifth day after lunch we will shut down the operation, clean up the equipment and SPLIT ALL THE GOLD found at the operation! Everyone attending the Arizona Gold Mining Adventure the full 5 days will receive an equal split of the GOLD found on their 5 days of participation. A "blind drawing" will be held so everyone has an equal chance to get any one of the GOLD shares. In the case of large nuggets a seperate drawing will be held. Please note that there is a strict limit of 10 paid participants during each Mining Adventure! This helps increase the share of GOLD each participant will receive at the end of the Adventure during the GOLD split and after 5 days of prospecting and commercial mining this can be a nice amount of GOLD, especially with today's GOLD prices. Both individuals, couples and groups are welcome to participate. ACCOMODATIONS: You are responsible for your transportation to and from the operation area as well as your basic sleeping arrangements. You may bunk at a local hotel or motel and drive to and from the operation each day or camp out at the operation in a personal tent or RV. Remember this is a primitive camping location as there is no common electricity without a generator or running water. There are toilet facilities available via a portapotty arrangement and water for bathing should you need it while camping at the operation and make prior arrangements for same. A hot cooked or grilled lunch will be provided for each participant on a group basis and you are responsible for your own breakfast and dinner. Should you have special dietary needs please provide these foods for yourself. A microwave, gas grill and a full kitchen for food preparation during lunch are available. Any other personal medical needs or creature comforts you desire you should bring along with you. Bring appropriate clothing for outdoors work and remember this is not a fashion show and the days are usually warm but the nights can get cool in the early Spring and late Fall. EQUIPMENT: The Paydirt Mining Company will furnish all commercial mining equipment necessary to conduct the GOLD mining operation. This equipment consists of a large trailer mounted trommel processing unit that is fed by a hopper conveyor system. There is also a GOLD Screw unit which is a smaller trommel processing system that can be fed manually with buckets or by another hopper conveyor system at the operation. Depending on the number of participants either or both may be used to help process GOLD bearing gravels. The hopper conveyor systems are fed with a loader and a backhoe is used to dig the gravels. All the heavy work is conducted by commercial equipment and not your back so you can enjoy yourself more! All GOLD prospecting equipment such as dry wahers for the first day's group GOLD prospecting lessons will also be furnished. You are also welcome to bring your personal equipment such as pans etc. to learn how to use them more efficiently. After the day's work is complete AAGP members are also welcome to go prospect the local claims should they desire to do so. Any GOLD found in this manner is theirs to keep and is not included in the 5 day GOLD split held on Friday. If you wish to have this option available to you be sure to join the AAGP prior to the Adventure dates in which you are participating. WHAT YOU CAN EXPECT: You will learn basic and advanced geology concepts and how they pertain to modern day GOLD prospecting and mining. The emphasis will be on placer mining, which is what the operation conducts so you won't be going down in deep, dark holes looking for GOLD. You will learn how to prospect for and easily find GOLD every time you go out. You will also learn how to run a real commercial placer GOLD mining operation and how to retrieve the GOLD from concentrates. Finally you can expect to take home great prospecting and mining memories and a wealth of new knowledge and don't forget your share of the GOLD recovered by the operation. Over a typical Adventure this can be anywhere from a quarter ounce and up for each individual. With every year that goes by it's becoming harder to almost impossible to be able to participate as an actual crew member of a real commercial GOLD mining operation and now's your chance. Be sure to do it at least once before your opportunity to do so is gone forever! You'll be glad you did! WHAT YOU SHOULD BRING: You should bring appropriate clothing and sturdy comfortable footwear for working in the desert and the operation area including a hat, leather gloves and any other clothing you feel necessary. You should also bring any snacks and fluids for hydration during breaks and may also bring any other equipment that you may wish to learn a lesson on for the first day of prospecting lessons. An additional bonus is for AAGP members who may wish to also use their own equipment and stay for the following Saturday and Sunday after the Adventure is over and work on the claims. PAYMENT: The Arizona Gold Mining Adventure is offered at $1,000.00 per person and must be paid in full and be received 30 days prior to the Adventure dates you are paying for unless prior arrangements have been granted. Dates will be rescheduled in the event of severe inclement weather. Individuals who reschedule their participation dates, and the original dates were participated in by others, will receive a 50% credit to the new rescheduled dates. No shows who do not show up for participated in dates receive no refund. Should you only be able to participate 3 or 4 days the price is the same as a 5 day adventure and you must make prior arrangements for this situation ten days prior to the start date. You will also only receive a split of the GOLD for the days in which you actually participated. Payment must be made by bank cashier check or USPS money order and made payable to the AAGP. Once payment is received final directions, all necessary paperwork and instructions will be sent to you. PARTICIPATION IS LIMITED to a maximum of 10 and a minimum of two participants per adventure and SPACES FILL UP FAST! Be sure to reserve your place on the Arizona Gold Mining Adventure by sending payment to the address below and making it payable to Arizona Association of Gold Prospectors. 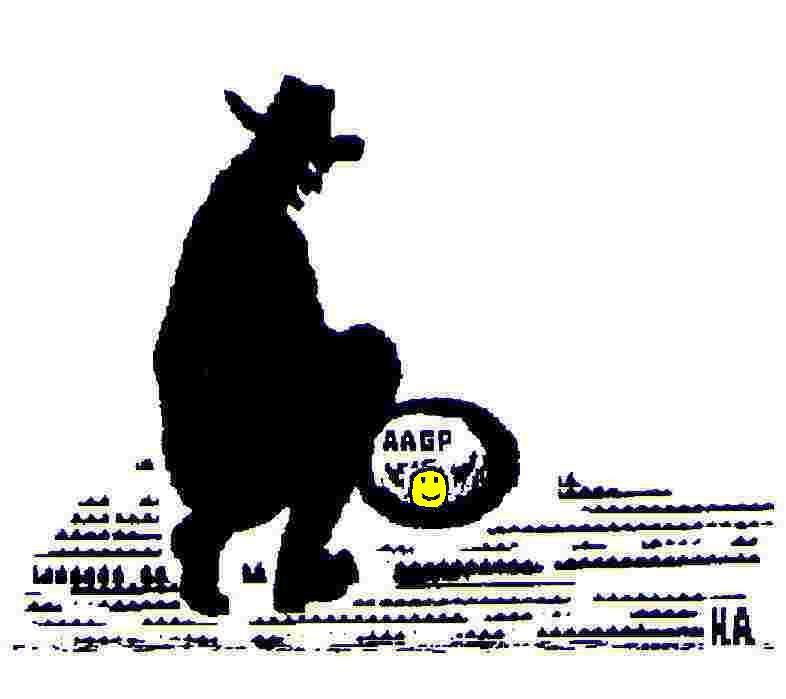 To find out more about your participation in the Arizona Gold Mining Adventure and capture the fun and excitement of the (G)old West in Arizona, call the AAGP at (623) 934-6882. Typical dates are one five day week in March, April, May, September, October and November. Call in to inquire as to the dates on which you would like to participate. The above dates are flexible and may be changed due to needs of the participants. The dates are typically the 2nd or 3rd week of the month in which they are held. If your needs would be better met by another week's dates just call us and let us know and we may be able to accomodate your needs. There is a minimum of 2 participants per Gold Mining Adventure due to staffing and logistics requirements for the participants and the operation itself. YES! I WANT MY SHARE OF THE GOLD AT THE ARIZONA GOLD MINING ADVENTURE! NOTICE: In case of bad weather or other unforseen reasons, alternative dates will be chosen with the paid participants and only they will be notified for the dates that are changed.